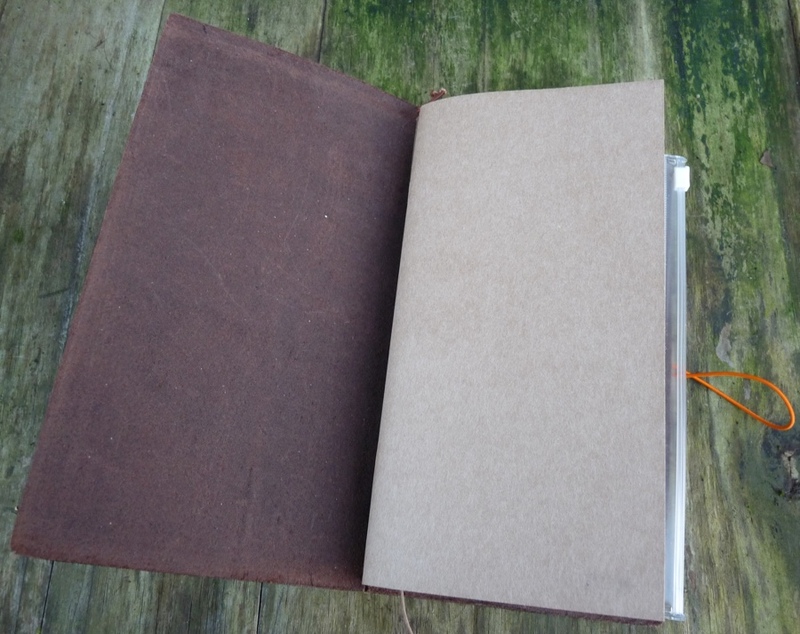 An Introduction to the Midori Traveler’s Notebook (part one) – Pens! Paper! Pencils! 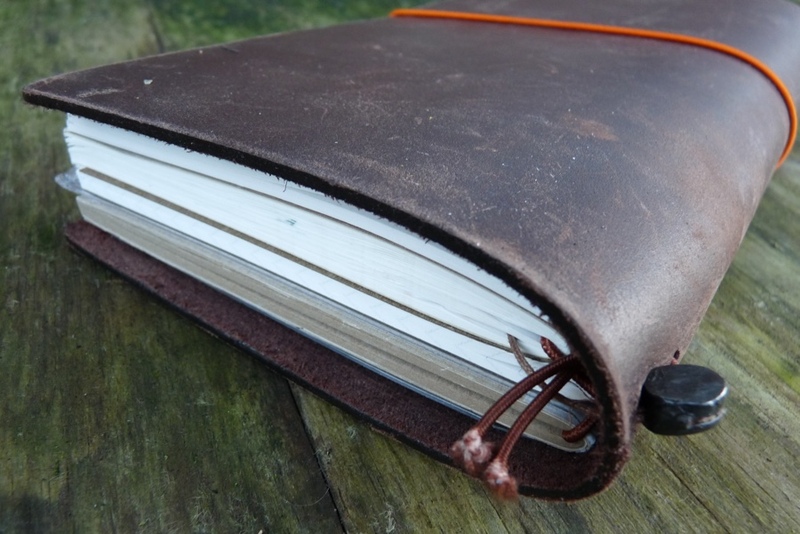 The Midori Traveler’s Notebook is legendary but, to me at least, quite intimidating. It’s quite pricy to get into and there is an overwhelming number of options. I’ve spent quite a long time looking at it all from afar, not quite knowing where to begin. Then a month or so ago the rather wonderful Journal Shop were kind enough to send me a starter pack for me to try and to write about. In an effort to help people who were in my situation to decide if the Traveler’s Notebook is for them and, if so, know where to start, here is the first of a three part guide. This first part is an introduction to the basic system and the cover. Part two will cover refills and part three will dip a toe ever so slightly into the vast array of accessories. 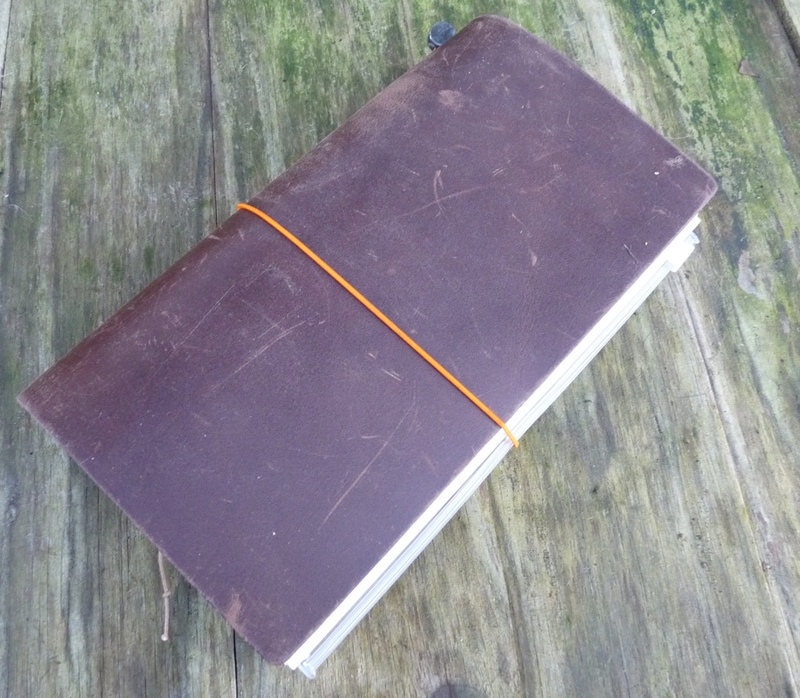 At it’s most basic, the Midori Traveler’s Notebook is a simple leather cover with an elastic band to hold notebooks inside, an elastic band to hold it closed and a thread to mark your page (like the ribbon you get in many notebooks). 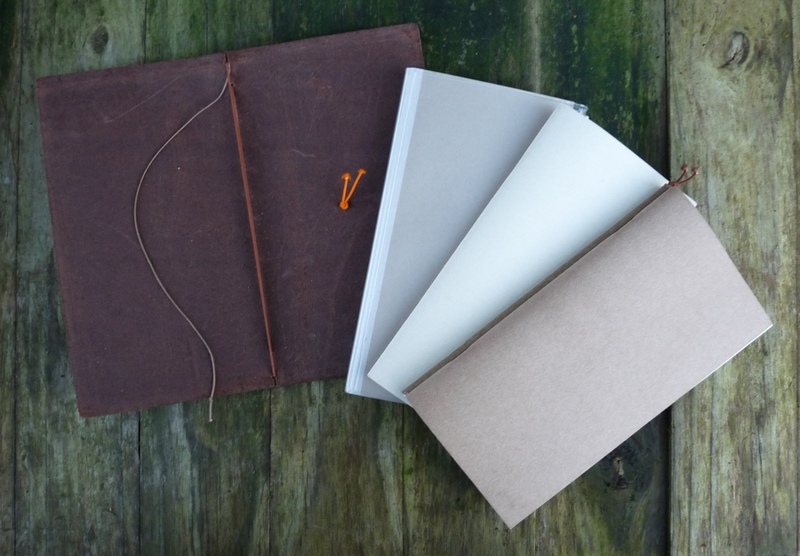 There are two sizes, the standard size (that I have) which is 12cm by 22cm (about as tall as an A5 notebook but a few centimetres slimmer) and the smaller pocket size which is 10cm by 13.5cm. The cover itself is very high quality. The leather, which is available in dark brown or black (with other options sometimes available as special editions), is thick and durable. The only mark on it is a simply stamped ‘Midori Made in Thailand’. 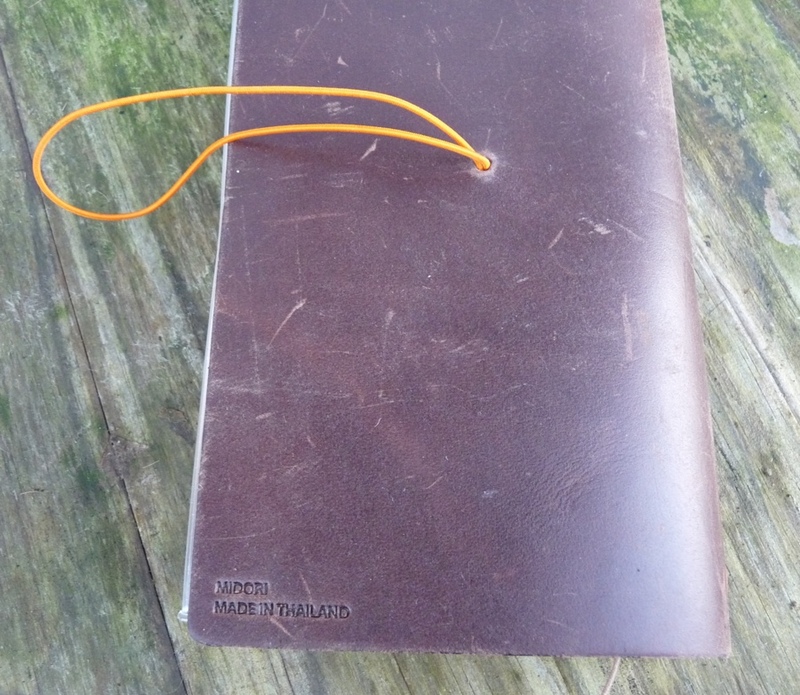 Midori Notebooks are meant to be used and the leather ages beautifully (and quickly) as it picks up scuffs and scratches. 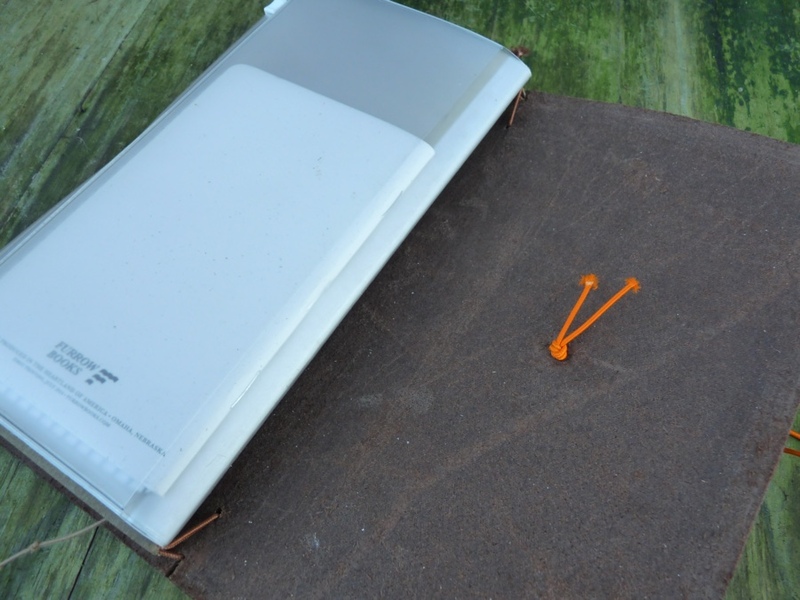 This isn’t the solution you are looking for if you like your notebooks to remain in pristine condition. 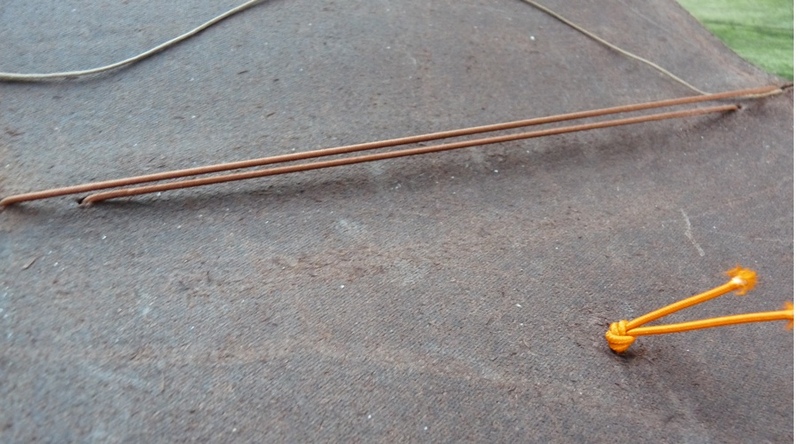 When you buy a cover you will also receive a coloured elastic band (actually two, one as a spare) that is held in place with a knot inside the centre of the back cover. This band wraps around the cover to hold it closed. You also get a cotton carry case, which is just a simple (though lovely) bag, not something I’ve found useful, and a plain paper refill. I’ll write about the refill in part two but what you need to know for now is that it’s held in place with an elastic band that’s threaded through the spine of the back cover and held tight with a tin fastener. What you have, then, at its most basic, is a very high quality leather cover that will hold up to six refills. The refills are a proprietary size but the Midori Traveler’s Notebook is so popular there are many non-Midori options. Check back soon to find out all about the standard range of Midori refills. You can read Part Two, all about the refills, here. Thank you so much to The Journal Shop for sending me all this stuff to use, keep and write about. They are a great shop with excellent customer service and they have a huge range of Midori products. I’ve tried not to let their generosity influence my views. The size doesn’t suit my needs either, anyway. Hi Daniel. Thanks for reading! I’m planning on saying a little more about the hype and value in the third part. I have some more thinking to do about it all.